Story: With Zatoichi, Takeshi Kitano, best known for such gangster films as Violent Cop, Boiling Point, and Brother, makes his first period drama, an updating of the classic Japanese character portrayed by Shintaro Katsu in movies and television from 1962 to 1989. Zatoichi is a blind samurai who shuffles from town to town, righting wrongs with his remarkable sword hidden within his cane. He is also a masseuse who likes to gamble. Kitano serves as director, writer, co-editor, and star of the film, playing the protagonist under his acting name, Beat Takeshi. 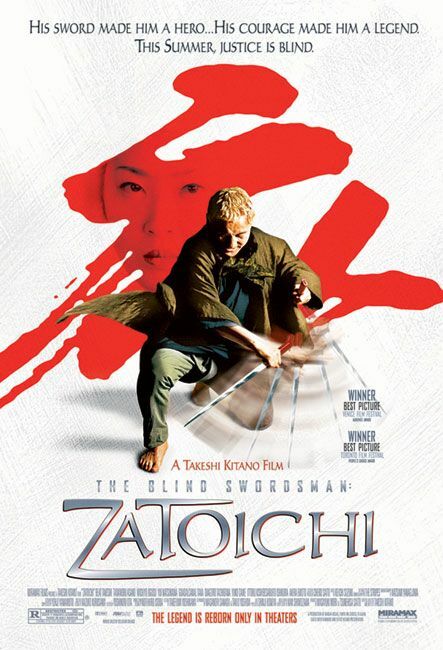 This version of Zatoichi, based on the stories of Kan Shimozawa, is more violent than the earlier series, as Kitano strives to make it more realistic. He has also infused a clever sense of humor, while cinematographer Katsumi Yanagishima adds beautiful depth of field to many scenes. When Zatoichi arrives in a small town, he unknowingly walks into a classic tale of revenge, as two women plot to kill the men who murdered their family. As Zatoichi becomes more involved, an eventual showdown with young samurai Hattori (Tadanobu Asano) is inevitable. Zatoichi is thrilling filmmaking at its best, an endlessly entertaining samurai epic from a man who fully understands the genre and is not afraid to take it to the next level.